Letters written on the pages of books are like paintings on paper. Any language, any direction of flow creates an imaginary composition that awakens in the artist the urge to create works between the pages of the book, on the book cover and with the book. 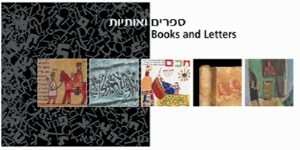 The current exhibition offers a glimpse into the world of this unique art which many contemporary artists, including Israelis and Jews, have created works that celebrate the letter and the book. Mane Katz is an artist that created many works on Jewish topics describing the way of life, such as weddings, births, circumcision ceremonies and daily life as remembered from his time in the Russian shtetl. His painting "A Yeshiva boy with a book" is a seemingly uneventful topic; however in contemporary secular art there is not and probably will never be any documentation of a barefoot boy wearing a fringed prayer vest, with one hand on his belly that seems to be suffering hunger, while the other is holding onto a great treasure - a book that provides the spiritual satisfaction that fills his world. Nahum Gutman's painting of "Neveh Zedek", Tel Aviv's first neighborhood, describes a small shop at the door to which is seated a beggar and behind her two religious youths are walking. One of them is holding a book, but its face is hidden by a pole. The figure walking in front is holding a walking stick. The probable analogy is that the book is a supporting stick, where the artist is saying: "We are people of the book, and books are the source that supports our existence". 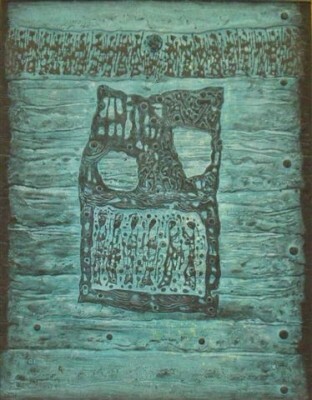 Arieh Aroch in his painting "Moshe Rabenu from Sarajevo" describes Moses holding the Ten Commandments. His features are not clear but a halo of light surrounds his figure and at his feet is a shtetl painted in black and emphasized in blood red. This painting was done in tribute to the magnificent Sarajevo haggada (= Passover book), which is illustrated with gold and silver leaf Renaissance pictures, and which greatly influenced Aroch's works. Prof. Mordechai Omer interprets this work in the catalog of the retrospective exhibition held of Aroch at the Tel Aviv Museum and claims that Aroch presents a new meaning, which is the interpretation of an Israeli artist of the generation following the holocaust. Moshe is described as a divine figure that does not go down to the people but to the destruction, ruins decorated with blood or sort of burial caves. Moses holds the Torah in one hand as a symbol of the connection between the Jewish people, whose world was destroyed through all the periods of persecution and holocaust, and turned towards his god as an admonishing finger. "In the beginning god created the heaven and the earth" the work by Mordechai Ardon also on display, describes the beginnings of creation according to Judaism, where next to the quotation of the verse that begins with the letter ? (Hebrew letter b) emphasized in red there is a flow chart of the six days of creation. Each day is drawn within a separate circle with the symbol that describes that day, while the background is painted like a Torah scroll. Ardon is an artist of symbols, who often uses letters and Jewish and cabbalist symbols. Here he creates a balanced relationship between the written letter and the symbols that relate to the phrase of creation as a vitruvian symbol of the creation. Castel began his journey as a mature artist in Paris where he was exposed to artists such as Soutine, Modigliani and Rouault, was influenced by them and painted in the post-impressionist style. When he returned to Israel, he searched for his path as an Israeli and Jewish artist, until discovering the written letter as the source of inspiration. Later on Castel concentrated on the actual word during the period known as "halleluiah". When the hidden scrolls were discovered they had a deep affect on his art, and his works with the ancient Hebrew letter on the basalt background are reminiscent of the scrolls. The work titled "scroll and figures" displayed in the exhibition, is also made of basalt and clearly influenced by the scrolls discovered in the caves near the Dead Sea. Castel tore into the basalt, which is the basic Galilean soil on which he grew up in Safed and Tiberias and he joined this material to the ancient Hebrew letter that is thousands of years old. "The Zeigermacher" (Shalom of Safed) and Lea of Jerusalem are two naive artists of different generations: the one lived in Safed as a watch maker (zeigermacher) and the other lives on the Golan heights. Both, each in their own style, create scenes based on Jewish writings. They present their personal interpretation of these textual sources, merging the painting with the Hebrew letter, in order to achieve naïve painting perfection, "Mordechai and the sons of Hamman" by the Zeigermacher is a description of a scene from the scroll of Esther. The work is constructed like a sort of film strip or comic strip. Lea of Jerusalem is displaying her work titled "A Jerusalem haggadah" which is a Passover haggadah that contains 68 silk screen prints. Each page of the haggada is independent and provides a personal perspective to the Passover story. Her intention is to convey to contemporary observers, as well as to future generations, a wonderful story accompanied by a richness of paintings, illustrated songs and prayers. "Sonia with Books" by Jan Rauchwarger is a large size painting describing a figure leaning on a pile of art books. Her right hand is touching her thigh while the left is leaning on the pile of books. 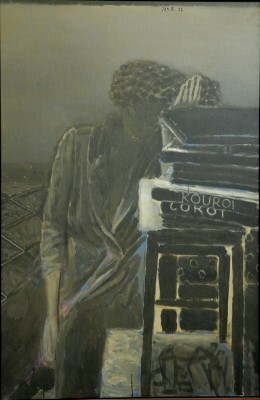 Only two of the titles are seen clearly: Kouroi and Corot. Underneath them is a painting that is nigh abstract nigh constructivist. The entire depiction works on the play of words between the two titles: the Kouroi book deals with classic Greek sculpture from the seventh and eighth centuries BC, which served as the model for tributary statues to the gods of Athena; whereas Corot refers to the nineteenth century French painter who painted in the spirit of the neo-classic principles that expressed an aspiration to return to the classic arts of Greece and Rome. Jan Rauchwarger paints Sonia as a Kouroi whose tribute is the art books, and as figures by Corot who was greatly occupied by the female figure. The modern painting under the pile of books connects the arts of the past with Jan's contemporary work. This composition may be an aspiration to express the continuity of generations and the desire to research the past through a modern painting. Two etching artist books are displayed in the exhibition. The first, a book of etchings and meditations "Face" by Ofer Lalouche (generously on loan by the printing workshop in Cabri), focuses on the subject of portraits with which Lalouche is greatly occupied and adds another aspect to the subject of the painted self portrait using words. His notes and meditations are positioned in the book opposite the self portrait empowering the effect by adding another dimension – the written word. 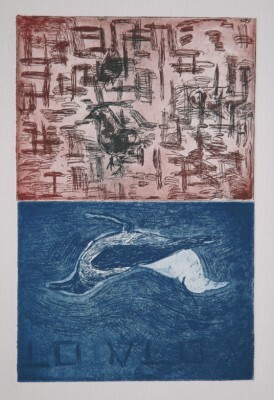 Galit Rauchwarger is exhibiting an album of etchings combined with sentences she has written. Galit is a photographer and etching artist that photographs life around the houses and scenery of Jaffa, such as graffiti which is a part of urban life. She etches scenes combined with writing, like private graffiti between the author, the creations and the personal "notice board". 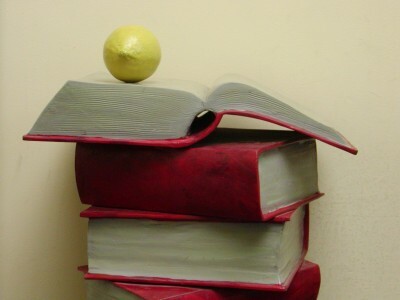 Meir Pichhadze is exhibiting the statue "The Tower of Books" – a tower of red books at the top of which is a yellow lemon, which appears to be stopping the tower from falling. Pichhadze, who came to Israel as a child, carries the stick of a wanderer in his works, where a central motif of his memories is the suitcase and books. These constitute a sort of home and culture that arrived with the artist to his new country. Above the statue is a three dimensional picture that describes three books, some open and some closed, inviting to read the culture of the artist's homeland in which the book has an important place and significance. Shai Zakai and Dov Or-Ner are exhibiting "The plait brain and iron memory" a book made of metalwork combined with photography. Each page allows "reading" the work from both sides. The book describes the increasing development of the plaint from one half of the book up to the middle, while the brain develops from the other side. Both meet and create the plait brain on the middle page. Shai Zakai and Dov Or-Ner work as environmental artists, researching our living environment through art. Zakai concentrates on the feminine-environmental aspect and researches the symbol of the female plait as the growth basis of the big mother, from which all life springs. The other part of the research is the stage of development of the brain and their combination as the foundation of logic and creation from which humanity is born. Yoav Ben Dov poses the "Scroll of Pomegranates" a large size work over which is suspended a two dimensional piece "Cloud". Yoav is a multi disciplinary artist who grew up among the Carmel Mountains and is occupied with the Israeli landscape patterns. The written word completes his work, because as far as he is concerned, our existence in this country is not complete without it. "The Scroll of Pomegranates" is described like an open torah scroll but instead of the calligraphic script Ben Dov uses the pictures of pomegranates as calligraphy. The pomegranate decorated with crowns conveys the rhythmic experience used by the calligrapher to allow the reader to create the rhythm and melody of reading the torah. Above the scroll the large cloud is a description of the holiness that reigns above flooded with the light blue light of the sky. Inside the cloud in writing that is difficult to decipher is a sort of calligraphy that each one can interpret as they please. The liquidity of the painting and the writing create a spiritual-lyrical painting, used by many of the founders' generation to describe the spiritual cities in the land of Israel: Jerusalem, Safed or Tiberias, such as the paintings by Mordechai Levanon and Joseph Zaritzky. Hagai Argov has put the Van Gogh Triptych on display. These are three oil paintings on the paper of an old art book about the artist Vincent Van Gogh. The book, which was owned by Argov's grandmother, was the first art book he knew. After his grandmother's death he found the book again and decided to use it, he took the three first pages and began to draw figures on them: icons of the Israeli male – football players and fans, the Israeli driver, etc. These images occupy the works by Argov and convey a message of the various layers of culture, as did Van Gogh before him.